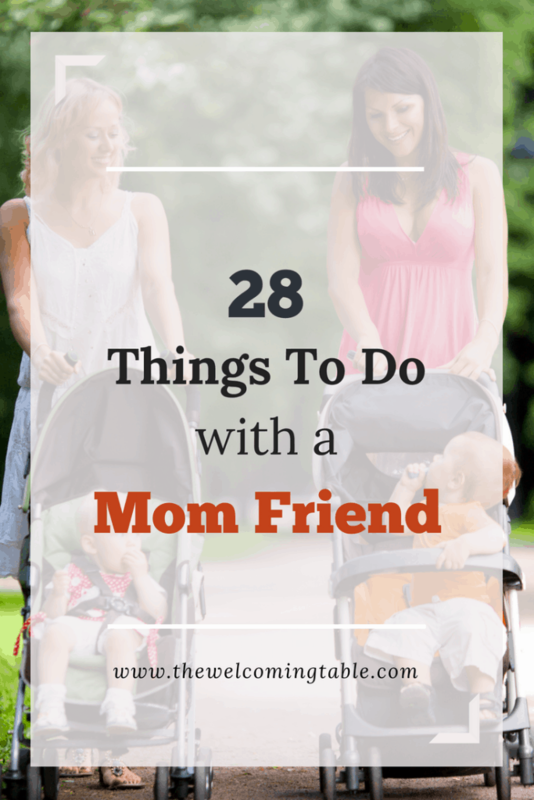 If you’re a mom, it’s easy to get into a rut when it comes to finding things to do with a friend. Going out to dinner is nice, but it’s also fun to add some more creative options into your friendship date arsenal. Plus, you can’t always drop the kids and go out with friends. 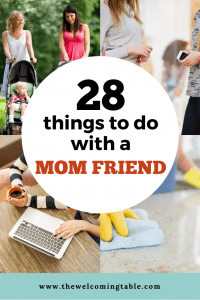 That’s why in this post, I’m sharing 28 things you can do with your mom friend, some with kids and some without. You ready? Let’s jump in! Run errands together. Leave the kids with the dads while you two grocery shop, pick up prescriptions, or get haircuts. 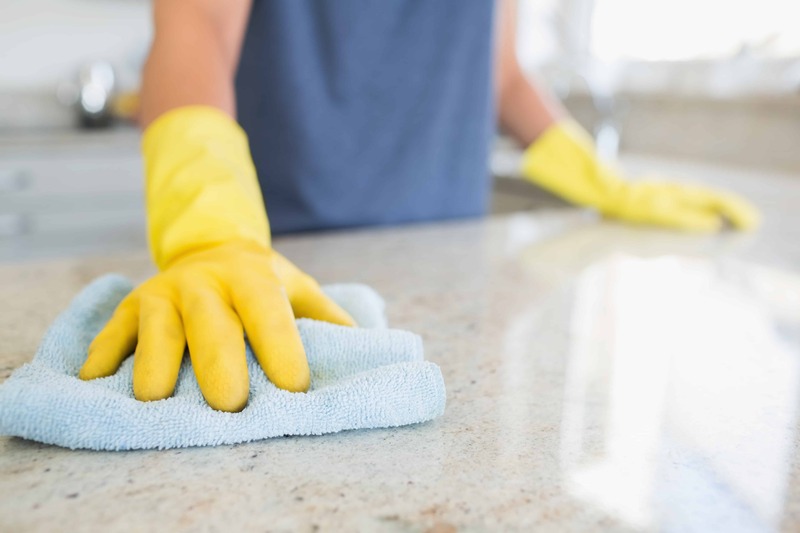 You can learn a lot about someone when you spend time doing day-to-day tasks together. Meet up for lunch at Chick-Fil-A. After the kids are full of chicken nuggets, send them to play in the play place while you catch up on life. 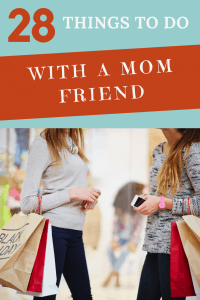 Join a moms’ group together. Walking into a room of strangers is a lot easier if you have a buddy with you. If the group isn’t a good fit, at least you have a new memory with your friend! Cook freezer meals together. A couple of hours of chopping, slicing, and sautéing goes a lot faster with a buddy, plus you’ll be making mealtimes a lot easier on yourselves. Go see a movie. Watch the latest romantic comedy or drama — anything that’s NOT animated. Go on a walk. 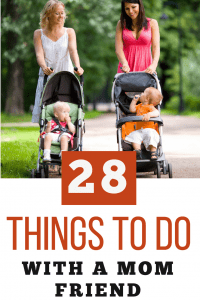 Load the kids into strollers and get some fresh air! Let your kids have a sleepover while you stay up and play board games. Try something like Settlers of Catan, Ticket to Ride, or Kinder Perfect. Meet up at the gym to work out together. With the kids in childcare, you can walk on treadmills or try a new class. Get together for lunch and a playdate. Offer your house and keep things simple. Fix PB&Js and fruit for the kids and make a hearty salad for the moms. Hang out during naptime. Arrange for your babies or toddlers to nap at the same time at one house while you browse Pinterest or work on a DIY project together. I did this with a friend with our kids were little, and it was so much fun! Start a new hobby together. Learn to knit, do hand-lettering, or play guitar. Take turns helping each other organize a section of your houses. Her playroom one week, your pantry the next. It’s so much more fun to do organization projects with a friend. Gather more friends. Call a couple of other girlfriends and get together at a nearby Happy Hour. Or do something crazy like going line dancing or organize a group scavenger hunt. Read a book and discuss it together. Try Girl, Wash Your Face by Rachel Hollis or Frientimacy by Shasta Nelson. Go garage sale-ing together. You can get some great deals on kids’ clothes and toys, and one person can focus on driving while the other keeps her eyes peeled for good stops. Meet up at the park for a playdate. Let the kids get out some energy while you push them on the swings or visit on a shaded bench. Go clothes shopping together. She can encourage you to try on something you’d never pick out on your own, and you can tell her whether or not she can pull off that crazy outfit. Go to storytime at the library together. You could even pack lunches and eat outside together afterwards. Take your kids to your city’s Science museum. Catch up on life while the kids learn and play. 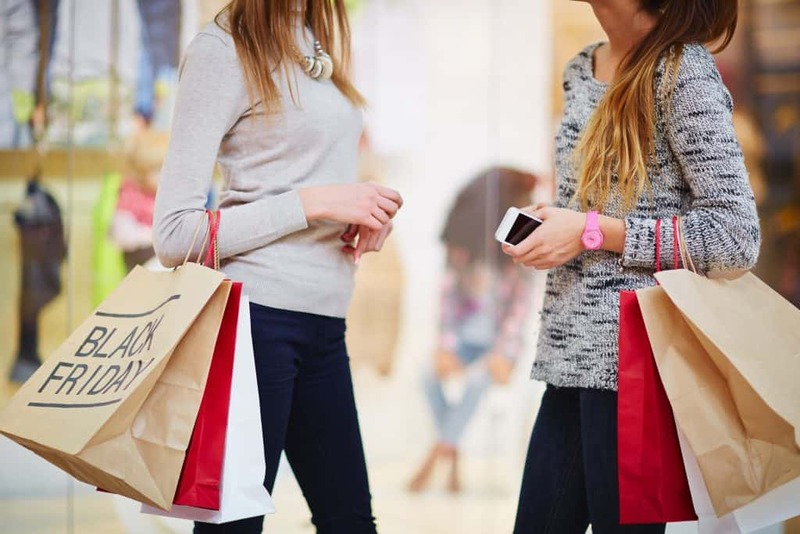 Shop consignment sales together. 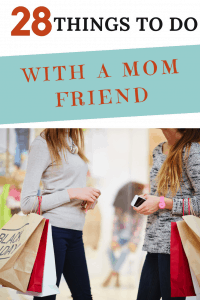 Get each other’s opinions on kids’ outfits and benefit from talking to a buddy while you wait in the long checkout line. Go U-picking together with the kids. Check your local farm’s schedule to see what’s in season, then pack some juice boxes and some sunscreen, and enjoy a day outside. Meet up at a bookstore. 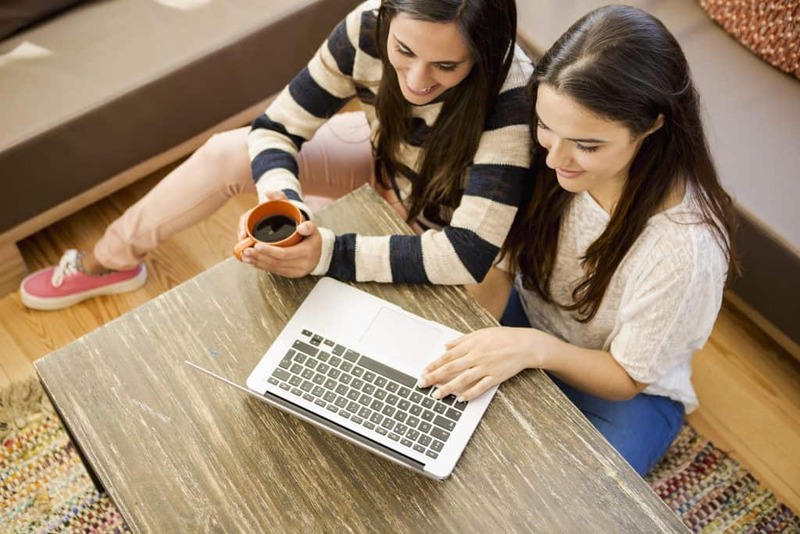 Read the latest parenting or decorating magazines together, flip through cookbooks, or just drink coffee and visit. Invite her family over for dinner. Keep your menu casual (something easy and kid-friendly like my Easy Homemade Chili) and let her bring the dessert. Just enjoy some good food and time to catch up. Train for a race together. Sign up for a local 5k and use an app like Couch to 5k to help you build up to it. Get pedicures or manicures together. Visit while you get pampered — you deserve it! There’s no limit to things you can do with a friend. Sometimes you just need a few creative ideas to help you break out of your dinner-out rut. Do any of these ideas sound fun? 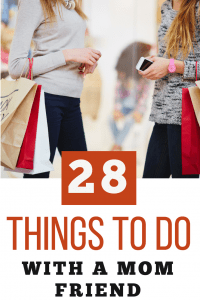 With 28 options, you’re sure to find at least one that appeals to you. Pin this post for later so you can have instant inspiration when a friend wants to hang out! 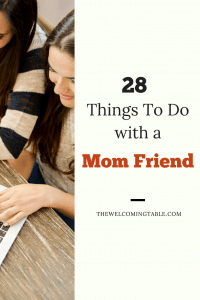 If you liked this post, you might also like How to Make Friends When You’re Starting Over or Building Friendships with Dinner Guests! These are some great ideas. My friends and I keep talking about doing a rotating cleaning/decluttering party, but haven’t done it yet.